SPRINGFIELD residents are calling for the Twelfth parade in the area to be re-routed following breaches of a Parades Commission ruling by at least one band taking part in last weekend’s Orange Order Whiterock parade. The annual march passed off peacefully following a number of restrictions imposed by the Parades Commission, including limiting the number of marchers allowed on a contentious stretch of the Springfield Road, as well as a ban on paramilitary regalia. However, residents who held a silent protest during the parade last Saturday say regalia honouring UDA/UFF members was worn by at least one of the bands taking part – and photographs back up their claim. Those present said insignia dedicated to UDA/UFF leaders John Gregg and Rab Carson adorned the drums and uniforms of the Cloughfern Young Conquerors from Newtownabbey. The pair were high-ranking members of a Rathcoole-based unit of the UDA responsible for numerous sectarian attacks, including a failed attempt on the life of Sinn Féin leader Gerry Adams. Seán Murray of the Springfield Residents’ Action Group said: “We noticed a couple of breaches on the day and we are going to draw those to the attention of the police and the Parades Commission within the next few days. 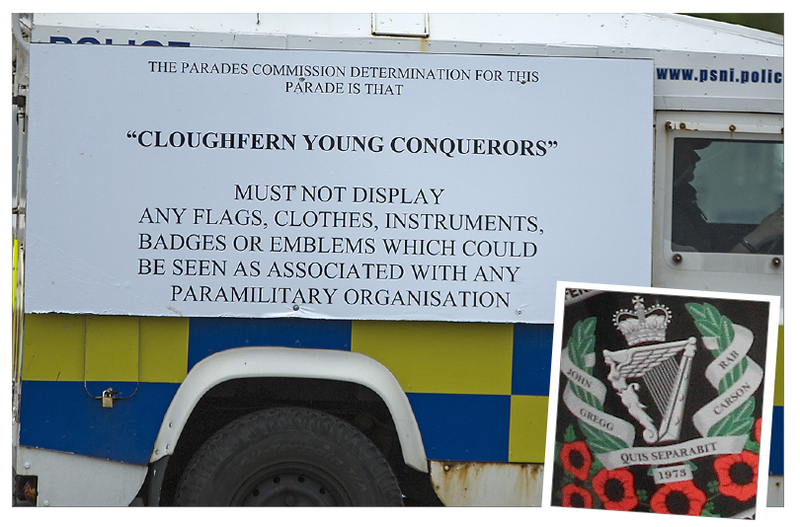 “Obviously there is a concern here that despite being warned clearly of the restrictions, displayed on a large sign on the side of a police jeep, the bands have again worn paramilitary gear. “The paramilitary leaders they are honouring are well known for the pain they inflicted on this community. We want to bring serious attention to this breach, and for the Twelfth we are recommending the entire parade is re-routed through the Mackies site. “We are also collating information on two other bands regarding further breaches of the determination,” he added.